Imagine the throng of Buddhist devotees descending upon this little Malay fishing village to make their passage of way to this temple on top on a hill during the auspicious days of the temple’s calendar. The temple and the village, Kampung (village) Muara Tebas best exemplifies the racial harmony and religious tolerance in Malaysia. And this co-existence dates back to two hundred years ago. Ching San Yen is a Buddhist temple located about 30 KM from Kuching City. ‘Ching San’ means ‘Green Mountain’ in Chinese. It is situated on a 2.5 acre site on a hill, 120 ft above sea level. One has to climb 142 steps to reach the top. "The Sarawak Book Of Amazing Facts & Records" published by the Ministry Of Tourism of Sarawak in 2011 described Ching San Yen Temple as the most decorative Buddhist temple in Sarawak. There are two versions on the origin of Ching San Yen. The first version is when, about 200 years ago, the Chinese immigrants who had safely arrived at the estuary of Sarawak River went on to build the temple to thank Budhha, Bodhisattvas & Machu (Goddes Of Sea) for their blessing of a safe voyage from China. The immigrants would come to the temple to worship from time to time to receive blessing for good health and good business. The other version tells of, when Chinese came to Sarawak to trade about two hundred years ago, they started a trading station along the sea-side at the foot of a hill. The site was chosen for its good geomancy to place the statue of Budhha, other Bodhisattvas & Machu (Goddess of the Sea) in return for good business and blessings. When they needed fresh water, Buddha indicated to them a well at the foot of the hill. This eventually led to the building of a temple on the hill facing the sea. The well is still in existence and had been the source of fresh water until 1980 when water supply was extended to the village. Ching San Yen underwent a major renovation and extension work in 1994 and was completed two years later. The seafood restaurants get the freshest catch for your menu. And they are popular with Kuching residents. Muara Tebas Malay Village located at the foothill of the temple site. THE STRING SISTERS is a band that I’ve been lusting over for a long time. 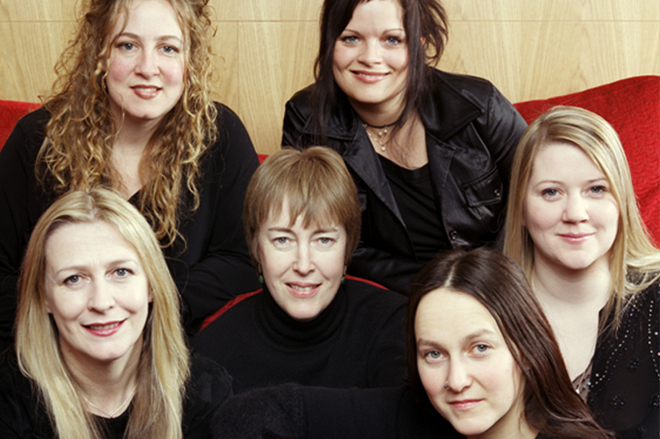 Six of the world’s leading female Celtic violinists backed by an all male rhythm section. With their own frantically busy solo careers, they cannot get together very often. To actually find that they can make it for the Rainforest weekend was like winning the lottery. - Liz Carroll who was the first Irish-American musician nominated for a Grammy and won the Gradam Ceoil “Traditional Composer of the Year” in 2011. And they play with four of the most sought after rhythm section on both sides of the Atlantic – James Mackintosh on drums, David Mulligan on piano, Conrad Ivitsky on bass and Tore Bruvoll, another Grammy nominee on guitar. I have been trying every year to get them to Malaysia since I saw them at the fabulous Forde Festival in Norway. All that fiery fiddling. And some of the most lovely haunting Irish and Swedish vocals. And now we’ve succeeded in squeezing one day out of them. They play on Friday night the 13th of July, the first day of the festival, and early the next morning, the two American girls get right back on the plane to return just in time for their next gig in Chicago. So if you miss them, they’re gone!